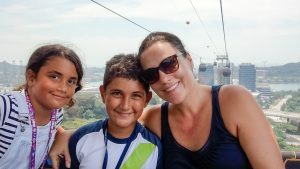 After yet another copious breakfast with pancake, French toasts, fresh fruits etc… Dragana takes us by MRT to the Harbourfront Gondola station. We first take the Gondolas to Faber Peak, from this vantage point, we discover a new part of the city, and the surrounding sea and islands. After a pit stop in the complexes’ bathroom with a view, and the obligatory stop to ring the happiness bell. 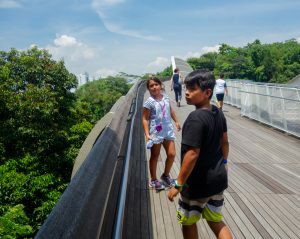 We stroll on the jungle covered paths and get to see a snake and get to a boardwalk and the elegant Henderson Waves bridge. And of course there is food, from fast food to top notch restaurants such as a Robuchon one! 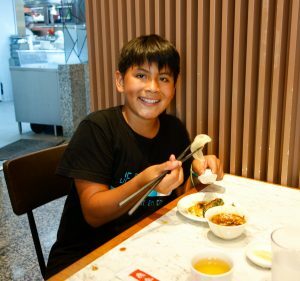 Our young foodie, Luka is very keen on having lunch at Din Tai Fung, a one Michelin Star Taiwanese dim sum restaurant chain. The kid knows what he is talking about, the food looks amazing here. We get to see how the cook prepare the delicate morsels! They really have a savoir-faire to roll the pastry. Ryo and Sandra who roll their gyoza dough with a pasta machine are impressed. While we wait for a table, Dragana marks our selection on the provided list, under Luka’s strong scrutiny. He takes this very seriously and doesn’t follow Mila and Ryo, who are happy to spend the announced 15 minutes waiting time in the neighboring candy emporium. The organization is super-efficient, and we soon find ourselves seated with a lot of delicacies. The signature dim sum is to be transferred delicately from the bamboo tray to the porcelain spoon with the chopsticks, then you poke it open: a fragrant broth fills the spoon, you remove the dim sum with your chopsticks again, drink the broth, dip the pork pastry in a soya, vinegar and ginger sauce, and eat it. It’s fun, and refined. With that we have shrimp dim sum, noodles, egg rice with pork, garlicy mini bock choy and greens, seaweed and vermicelli salad and to finish a yam steam cake… it’s superb! And as usual we clean everything up! 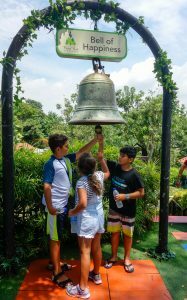 We get back to the MRT on the Sentosa Boardwalk bridge and send the kids back home as we agree they will enjoy an afternoon in the pool rather than touring the ethnic quarters. They are excited to make their own way home. 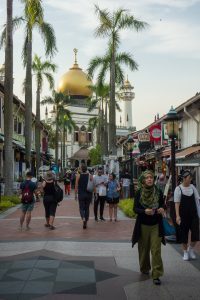 Dragana takes Skye and Sandra to China Town, little shops in pretty and colorful colonial houses line the streets, various places of worship in a small radius show how religions manage to co-exist. We visit a Tamil temple, an impressive Chinese and original temple with various representation of Buddha and go by a mosque. Another street is the China Town Hawker center boasting yet again fantastic food. A lot of the little shop are Chinese apothecary. Getting back on the MRT, Dragana takes us along the Parkroyal Hotel, with it’s hanging gardens, it is quite spectacular. Little India is lively and very colorful, again there is a stark contrast between the little colonial houses and the skyscrapers. We poke our nose in the covered market, it has definitely an Indian feel to it. 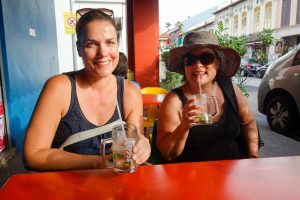 Dragana spots a lady with a lime juice drink and decides we should have one too. We stop in a little stall by the textile street and sample the lovely drink. It’s made with heated little limes that are orange inside, water and sugar: tasty and refreshing! We walk a bit more past jewel shops and sari boutiques, the jewels are very ostentatious, Indian style! It’s getting late so Dragana puts us in a taxi to check the mosque in Arab Street. And It’s worth the detour, it seems right out of Yasmin’s palace in the Disney Aladdin cartoon. We wander a little more in the 1000 night décor, the textile shops, lantern and tea boutiques and take a last cab to go back home and enjoy the pool. 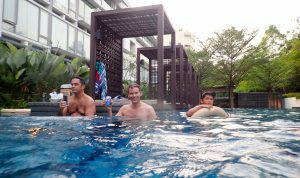 The kids and Arash are already relaxing in the water when we arrive. Maricel has prepared a Filipino curry for dinner, but the boys and the kids will end up eating take away burgers. 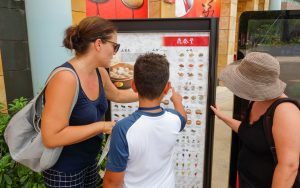 It’s time to leave, the Raggazzi puts us in a Huber and we leave for Changi airport were we have time for a bit of shopping: we find the Jumbo pepper crab mix and find screens in the terminal were you can look for shops to get to a TWG tea boutique. For the first time we board a A380. We skip dinner after having been fed so royally in Singapore and soon fall asleep for 6 solid hours. Again a successful and highly enjoyable vacation! !